The Whitest Boy Alive was a German-Norwegian musical group based in Berlin that was active from 2003 to 2014. The band comprised singer and guitarist Erlend Øye of Kings of Convenience, bassist Marcin Öz, drummer Sebastian Maschat, and Daniel Nentwig on Rhodes piano and Crumar. The Whitest Boy Alive started as an electronic dance music project in 2003 in Berlin, but since slowly developed into a band with no programmed elements. The name of the band comes from the idea of a naïve, shy northern European boy that their music is about. The band's German record label was Bubbles. Their debut album Dreams was released on 21 June 2006 in Germany. 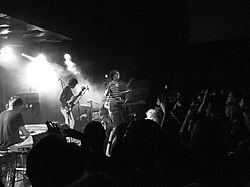 In July 2007, Modular Records signed them to their UK imprint and the band played their first UK performance with New Young Pony Club at the London Astoria in September 2007. The album was released in the UK with the single "Burning" in November 2007. The band released their second album Rules in March 2009. It was recorded in a newly built studio located on Punta Burros, Nayarit, Mexico. Their single "1517" was also featured in the soundtrack of the video-game FIFA 10. The band started The Whitest Boy Alive + The New Wine tour in April, 2009, visiting Germany, Denmark, United Kingdom, Switzerland, France, Netherlands, Belgium, and Sweden. In 2011 the band travelled to China with promoters Split Works. In June 2014, the band announced via their Facebook page that they "are no longer composing or playing together as The Whitest Boy Alive." ^ Abberfield, Yvette. "The Whitest Boy Alive Review - The Tivoli Jan 19". Retrieved 18 June 2012.